For ladies who do more than lunch! 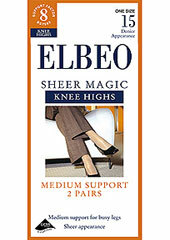 Let Elbeo support your legs and keep them fresh all day. Elbeo Caresse X Large Tights Compression Factor 10, give you wonderful support all day and every day. They are designed to help ease swollen ankles and aid blood flow up and down the legs. 30 denier appearance they have a semi opaque look about them. Lovely to wear and help your legs look and feel healthier. Rating: 4 Lovely tights, looked and felt good all day, but not long enough in the leg for me. Rating: 4 Good quality, substantial, good fit, good support for legs when tired or aching. Rating: 5 I would not order anything else, I've never had a problem and the tights are delivered promptly. I would definitely recommend to anyone, thank you, I'm a very satisfied customer. Rating: 3 I have used these tights for years. This batch seem to be slightly less supportive and the knit is not so smooth. They are ok but I have had better in the past. Still a good fit. Rating: 5 I find these tights very comfortable. I buy the XL size to get the length in the leg. Rating: 5 I have been using these for years. Have to. Trying to reduce swelling ankles and legs - bad heart. Don't know what I would do without them. You have an excellent prompt service, and one receives exactly what one ordered. Rating: 5 Quality of tights is good, although the toes always go before the legs, just my funny feet. Service from UK tights is excellent. Rating: 5 Very pleased with all aspects of service from UK tights. I know I'm always going to be satisfied with the tights, as I need to wear support tights all the time, not very pleasant but necessary. If that is the case for you, I wouldn't hesitate to buy these ones. Rating: 5 I actually order the tights for my nan who has used elbeo support tights for years she is 96 and still very happy with the product. Rating: 5 Bought for my mother, but I've had these before and they are comfortable, strong and supportive. Rating: 4 Good support and good quality. Long enough (I am 5' 9) without pinching or pulling. Rating: 5 Excellent product, very good price, difficult to buy locally, sent to door within 24hrs.